Status Update: How well is the church reaching out to people in the digital age? The industry term for the appeal of a Web site is “sticky.” Visitors (or “eyeballs”) stick to a site if it is interesting, lively, useful, provocative and generally appealing. Conversely, the “bounce rate” refers to how frequently initial visitors navigate away from a page to a different site. Sticky is good; bouncy is bad. How bouncy or sticky are Catholic Web sites? More broadly, how well is the church using social and digital media in its mission to spread the Gospel? Since “the church” can mean many things, let’s narrow the topic down: How well are those who work in church organizations in this country using social and digital media? First, the good news. These days almost every Catholic organization and diocese and most parishes have a firm Web presence. Available to both the devout and the doubtful, these sites are repositories of useful information. One can check out editorials in the diocesan newspaper, follow the pastor’s blog (and read his latest homily), make donations to a favorite Catholic charity, and check on Mass times. An up-to-date Web site is as much a necessity today as a weekly parish bulletin is (or used to be). More good news: The U.S. Conference of Catholic Bishops has found great success in the world of social media. It has over 29,000 “fans” on Facebook, where the conference sometimes sponsors trivia contests and where fans use the page for lively discussions. The conference also maintains its own YouTube channel and frequently updates its Twitter feed. Sample tweet: “Are you ready to spend some behind-the-scenes time w/Pope Benedict XVI at the Apostolic Palace? The grand tour.” (Note 4 tweeters: 2 save space drop XVI). The bad news is that more than a few Catholic sites are unimaginative, difficult to navigate, full of dead links and look like they have not been redesigned since the Clinton administration. In the print world, magazine editors are encouraged to redesign every five years. On the Web, reinvention happens more frequently. If the medium is the message, then the message is that the church is often a laggard. More lamentable than the appearance is the content: while church sites are repositories for information, they are often nothing more than that. While Mass times and donor information are important, a good Web site requires more than just raw facts. As philosophers might say, these are a necessary but not sufficient condition for stickiness. Most good Web sites are updated daily. If they want young eyeballs, then this is done several times a day. And good Web administrators post not just text but video, podcasts, slideshows and interactive conversations. If not, he or she should not be surprised by a lack of visitors. Those who wonder whether it is really possible to update sites daily would do well to remember that there is plenty going on in our church, so it is not hard to be creative: point viewers to international church news they might not otherwise see; upload videos of Catholic speakers; link to articles from your favorite Catholic magazines (hint); point to new (or old) Catholic art; and post the latest Vatican press release. Many church employees might say: “Are you nuts? I’m too busy!” But not updating is like having a microphone in the parish that is not working. A priest or deacon could deliver homilies that would put St. John Chrysostom to shame, but if no one can hear them, what is the point? Likewise, if church organizations do not maintain a fresh Web site or blog, fewer people—especially the young, who get their information digitally—are going to visit these sites and hear the church’s message, or even care if the church is speaking. Back to the good news: The official church has hit its stride in the blogosphere. Archbishop Timothy Dolan of New York blogs religiously (pun intended). So does Cardinal Sean O’Malley, O.F.M.Cap., of Boston, who supplements his blog with photos. The blogosphere is a natural place for articulate communicators, and there are many in the church. But blogs present significant challenges, like encouraging dialogue among readers and building a sort of virtual community. Take a look at a few diocesan blogs and note how many comments there are: often the number is zero. Why zero? Too often it is because the blogger posts and then walks away. To paraphrase Truman Capote’s comment about Jack Kerouac, that’s not blogging, that’s publishing. Responding to commenters encourages more people to read, post and discuss. This practice is not without its own dangers; it is easy to get bogged down in arcane theological e-battles. Accepting and publishing comments, even those not in line with church teaching, is another challenge that demands, besides patient catechesis, constant charity. Still more charity is required when the comments become ad hominem. “In omnibus caritas,” as Blessed John XXIII liked to say. Easy to say, but harder to do when someone says you are an idiot, a heretic (or both) or that one should be, as someone recently said of yours truly, summarily laicized. One area where the institutional church’s relationship with digital media is doing poorly is in its own reading of blogs; one can pay too much attention to those who are called “haters.” Not a few Catholic bishops, administrators, theologians, thinkers, writers, priests, brothers and sisters have been vilified for no good reason on Catholic blogs whose raison d’être is to police, condemn and attack. Some sites seem to have set themselves up as a Web-based magisterium, even when the inquisitors have little to no theological acumen. After all, on the Web no one knows that you are not Hans Urs von Balthasar. Sometimes these attacks ping around the Web and find their way to the Catholic school where the targets of the attacks work, the university where they teach or the diocese in which they minister. So a caveat: Don’t believe everything you read in the blogosphere. Remember that the authors of some so-called Catholic blogs are not always reliable. It is better to check with the subject of the attack. Back to how the church can better use digital media to spread the Gospel. As for the (somewhat) newer media, the church is still playing catch-up. That is understandable: church workers are busy folks. But the lack of attention may give the unwitting impression that the church considers Facebook, YouTube and Twitter as beneath them or inherently risible. “You tweet?” said a priest to me recently. “Whatever for?” When I told him that I post 140-character homilies every morning, he rolled his eyes. My response was this: Does the church seriously want to reach young people? I mean people who are really young—not just under 50, but under 25—young men and women in college or high school. The church longs to reach the young, but is it willing to speak not only in the language of young people, but in the modes they use? Or does the church expect them to come to it and speak, as it were, in its own language? Jesus, after all, asked his followers to go to the ends of the earth, not just to places where they felt comfortable. And Jesus did not sit around in Capernaum waiting for people to come to him. Sometimes people came to the house where he was staying; more often, he went to them. And more important, Jesus spoke in a language that people understood and used media that people found accessible. Using a mode of communication specifically designed to reach his audience, Jesus’ parables were vivid stories that drew from everyday life—simple tales about farmers planting seeds, women sweeping their houses, a man being beaten by robbers—and easily understood stories from nature—a mustard seed, lilies, birds, clouds. Jesus spoke the language of the people of his time, used examples from their daily lives and offered it all in a mode they appreciated. He was not afraid of being seen as undignified by talking about commonplaces like mustard seeds or sheep. The Son of God did not see that as beneath him. And if he did not consider speaking in familiar styles as undignified, then why should we? The truly creative church administrator, pastor or bishop might even think beyond current modes and into the fastest emerging field of digital opportunity: mobile communications, mobile app development and apps specifically designed for tablet computers (like the iPad). In every age the church has used whatever media were available to spread the good news. Jesus used parables drawn from nature and everyday life; St. Paul used letters to reach out to the early Christians; St. Augustine practically invented the form of the autobiography; the builders of the great medieval cathedrals used stone and stained glass; the Renaissance popes used not only papal bulls but colorful frescoes; Hildegard of Bingen, some say, wrote one of the first operas; St. Ignatius Loyola encouraged the early Jesuits to write and publish pamphlets, and the early Jesuits used theater and stagecraft to put on morality plays for entire towns; Dorothy Day founded a newspaper; Daniel Lord, S.J., jumped into radio; Bishop Fulton Sheen used television to stunning effect; and now we have bishops and priests, sisters and brothers and Catholic lay leaders who blog and tweet. No medium is beneath us when it comes to proclaiming the Gospel, especially to the young. This includes Web sites, but also all social and digital media. How sad it would be if we did not use the latest tools available to us to communicate the word of God. If Jesus could talk about the birds of the air, then we can surely tweet. Read Fr. Martin's "10 Dos and Dont's" for Web-savvy organizations. Great, Father Martin. As usual you are innovative, clever and ... to the point? Aren´t we missing the point when we focus the message in The Church or The Gospels... we do not believe in The Church or the Gospels, but in Jesus, his words and deeds. You did it again! Another great hit! Thank you, thank you, thank you, Fr. Martin. Truly a great piece! You really understand the technological age and are very generous to help out the rest of us navigate and make productive use of the new technology. #1 above, we should keep in mind that the Church and the Gospel are never separated from the person of Jesus, his words and his deeds. So I reallly don't understand your comment. The Church is the mystical body of Christ, a community of believers who are trying to live the good news (Gospels) as best we could (yes, we sin, falter, but the Sacrament of Reconciliation (Penance) is there to bring us back). We are continually exhorted, cheered along by St. Paul's message 2nd Corinthians 13:13 The grace of the Lord Jesus Christ, the love of God, and the fellowship of the Holy Spirit be with you all! And Jesus himself said "I will be with you always..... I will not leave you orphans....." That is the message, or part of the message! Father Jim - "summarily laicized" - LOL! The phrase struck me as hilarious, especially in light of some recent debates in the religious blogs (generating way more heat than light). Seriously, I have been waiting to see phrases like "off wit 'is 'ead!" appearing in the blogosphere. It's a good thing to take a step back, a deep breath and remember our relative puniness in the perspective of Heaven. As the old Yiddish proverb observes: "Mentsch tracht, Gott lach" (Man plans, God laughs). Would that more livestreaming pixel perfect homilists emulated the author's "140 character" restraint. If you haven't made your point in under 3 minutes, it ain't gonna happen in 13, much less 30! "The church longs to reach the young, but is it willing to speak not only in the language of young people, but in the modes they use? Or does the church expect them to come to it and speak, as it were, in its own language?" Aw Craig. Church officials will always be that way. Lighten up. There's the rest of us too! Fr. Martin: I visit many many Catholic web sites and churches as I travel. 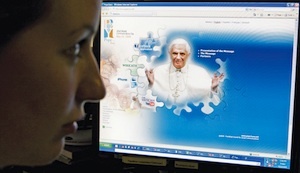 Many parishes are not even meeting the basics of the digital age on their web sites. When I visit a parish to go to Mass while traveling, I like to view that parish's bulletins on line before going to Mass to verify Mass times, and to get a flavor of what people are doing in the parish etc. It is surprising to me how many parishes are not even putting their bulletins up on their web sites even though they have a "web presence". parish recently merged with its old name boldly etched in stone over the front entrance but discordantly, a new wooden sign with the new parish name out on the front lawn. If this discordance isn't unwelcoming, I don't know what is. I often wonder what a non-Catholic must think as they drive past this parish with two boldly announced names. It seems to me, that instead of worrying about whether or not a parish is digitalized is secondary to having other ducks all in a row first, which include some basic marketing practices such as a consistent name for the organization. Of course, its easy to explain all of this away by saying that Catholics know what this is all about because they live through the mergers. However, as evangelists, it does not help. I KNOW THAT YOUR ARTICLE DEALS WITH THE MEANS OF COMMUNICATING THE GOSPEL. NEVERTHELESS, AS A NON-CATHOLIC ROADSIDE SPECTATOR, I AM GOING TO HITCH A RIDE AS YOU PASS BY AND LEAVE THIS NOTE BEFORE I JUMP OFF YOUR WAGON. Yes, I think I get you, #9 Harry. But sharing the Good News and spreading it far and wide presupposes that we should use different means, all means possible, and technology is just one way. Living the faith daily is still the best means of course. It is by lived example that we attract others to the Faith, to the reality of Jesus. A fantastic article, Fr. Jim. I'm reposting and sending to everyone I work with in Catholic circles. And I'm signing up for your morning homilies - didn't know you offered that! Alicia, where do you go to sign up for Fr. Jim's morning homilies? I am really still clueless about various sites to visit and participate in all these spiritual goodies. I frequently read the blogs at America and Commonweal. It's a sad truth that there are some liberal "haters" among the regulars who comment on these forums. One would think from reading the recurring comments at Commonweal that Archbishop Chaput is the reincarnation of Genghis Kahn. As for the blog authors themselves, they occasionally fall short of demonstrating Christian charity. On a personal note – I grow weary of hearing about Truman Capote’s putdown of Jack Kerouac. On the Road was selected to the Modern Library’s list of 100 Great Novels written in English during the 20th century. There were no titles by Capote on the list. Kerouac’s reputation has soared since his death and his work has been analyzed by a number of fine scholars like Douglas Brinkley. All of his books are in print, his estate is booming and many people, including my adult children, still read his books. I leave it to someone else to speak to Capote’s ongoing reputation. A fine post, Fr. Martin. I would add that the "haters" and producers of ad hominem attacks in blogs here and elsewhere come from both left and right field. Everyone has the right to play right, left, or center field, but not with blinders on, as if the other two fields are not addressed, you are not really involved in the game no matter where you stand. Craig, I would question your suggestion that the church hierarchy is clueless to the modes of the young in its public relations. The World Youth Days which my kids attended were highlights of their teenage years. And the million or so mostly young people who attended the funeral of John Paul II likely outnumbered those who attended that of, say, John Lennon, confirming his success as a communicator with the young. I would agree with you that the church expects the young to come to it, as well as vice versa. If the young Catholic adult doesn't know what the mass and transubstantiatiion are about, or doesn't think that St Augustine's Confessions or the life of St Francis has any relevance to his experience, or doesn't know the context of the life of Jesus, that is an immense loss to his faith and to the rest of the congregation. The church might best be seen as a two-way street, the old and the new pollinating one another. This article also appeared in print, under the headline "Status Update," in the July 4, 2011 issue.